Life and luxury: Save a Doctor!!! Help and Donations Needed!!! 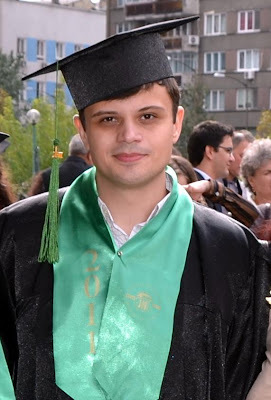 Catalin Sandu is a 25 year old young doctor who recently graduated from the “Carol Davila” University of Medicine and Pharmacy in Bucharest, Romania. He is now facing one of his biggest exams in life: defeating cancer. Catalin has a very rare and aggressive (and painful) form of cancer, a unique case in Romania, and each day is crucial for him. He can find treatment in Freiburg, Germany, but for which he needs the sum of 200.000 Euro. A bit over the half of this sum has already been gathered, but in order to start the treatment, he needs YOUR active help. Please donate - see info here - or share this story on all the social media and to all the people you know. (Note that EU remittances are FREE of charge). 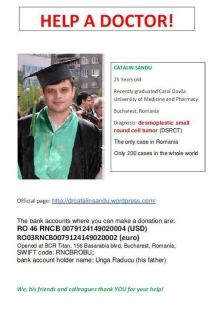 Catalin is a young doctor my age and I hope all the people who know me or read my blog will take a moment to donate today what tomorrow might mean Catalin's life!!! I am bringing you forward a case where "life" is a "luxury" for some of us and we realize maybe only in such cases how fortunate we are when we are healthy and can enjoy every minute of our lives and make new dreams. For now, a big part of the youth in Romania has ONE dream: to save Catalin so that he can save many lives to come in the future. So please DONATE!! !